The Neighborhood Services Division of the City of Sacramento’s Parks and Recreation Department will host a Youth Job Fair on Saturday, March 22 from 10 a.m. – 2 p.m. at City Hall Plaza Area (915 I Street). The Job Fair, aimed at individuals ages 16 to 24, will include on-site employers and educational resources. Attendees should come early and bring their resumes. Dress to impress. 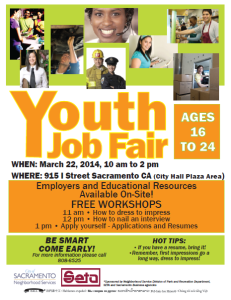 The Youth Job Fair is also sponsored by SETA and Sacramento Business agencies. Call 808-6525 for more information. March 7, 2014 in City Hall, Jobs, SETA, Youth.